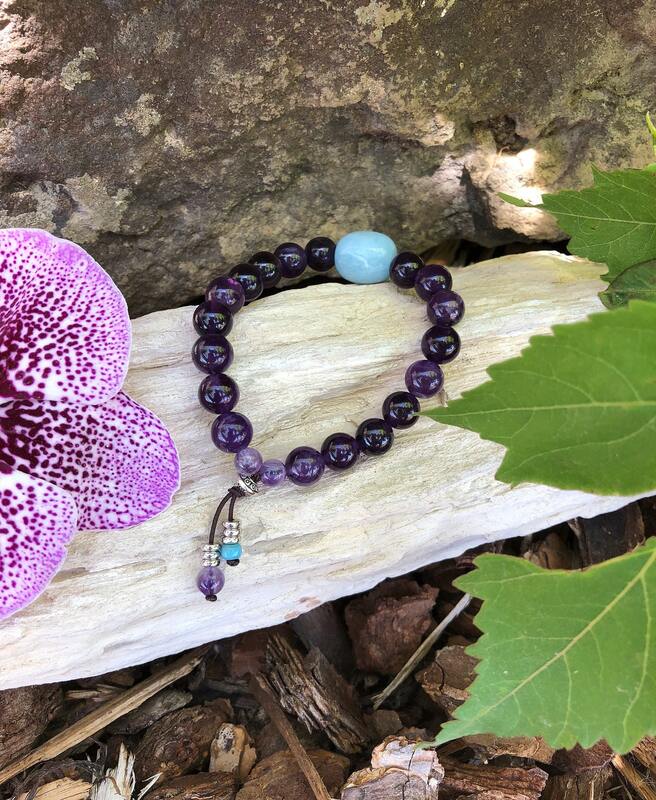 The Focus Bracelet features luscious AAA grade glossy purple Amethyst gemstones along with a gorgeous cool ocean blue Aquamarine gem to bring insight, awareness, clarity and focus to a busy mind. Amethyst has a trigonal system that continually gives off energy. It is always in a spinning motion that is neither positive nor negative in nature; it is balanced. Therefore it promotes balance. It carries a strong vibration that resonates with the crown chakra. 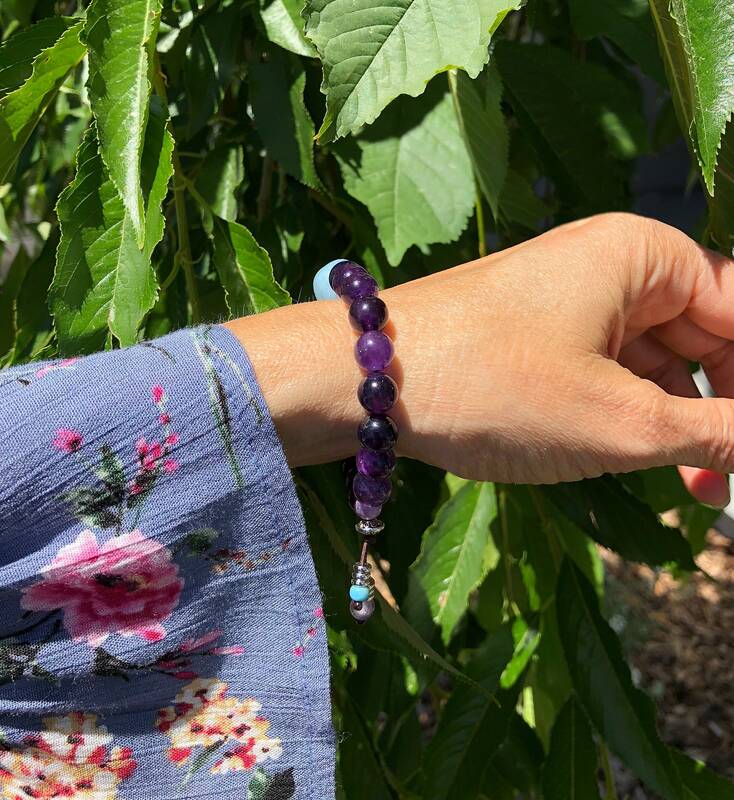 It connects you straight to the Divine, enhancing spiritual awakening and spiritual growth. 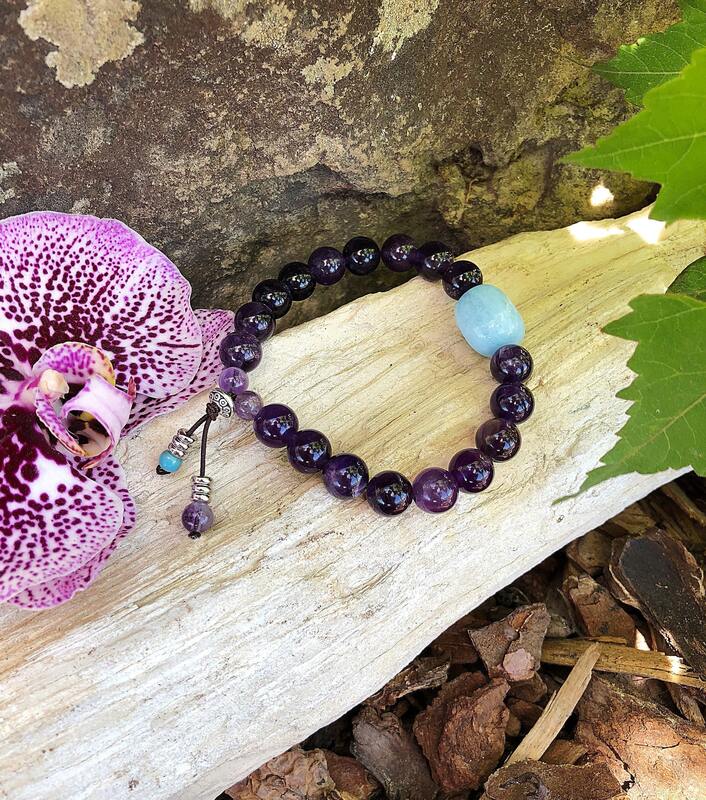 Our ancient ancestors wore Amethyst to relieve anxiety, lessen confusion, enhance focus, increase intuition and stimulate psychic abilities. Wearing Amethyst gemstones can actually build a protective energy shield around the body to protect you from psychic and emotional attack. Amethyst is also known around the world as the “sobriety stone” as it comes from the Greek word “amethusos”, meaning “not drunk”. Many people wear Amethyst for its ability to strengthen resolve and to bring the body back to a state of normalcy and peace. The stable, balanced energy of Amethyst can also help you rest and sleep. Aquamarine is derived from the Latin word for seawater. This beautiful sea blue gem gently calms emotions, reduces stress and quiets a busy mind. Aquamarine also amplifies courage, clarifies perception, sharpens the intellect and helps to clear confusion. It soothes fears of all kinds and helps you to release what nolonger serves you. Aquamarine also expands psychic channels and enhances intuition, especially clairvoyance. 8mm natural gemstones, strung on strong elastic stretch cord. One size fits most wrists. Custom sizing is available. Another beautiful creation from Brenda. Brenda's work is high quality and carries her beautiful energy. Love all my mala bracelets from her. Amazingly quick shipping too!